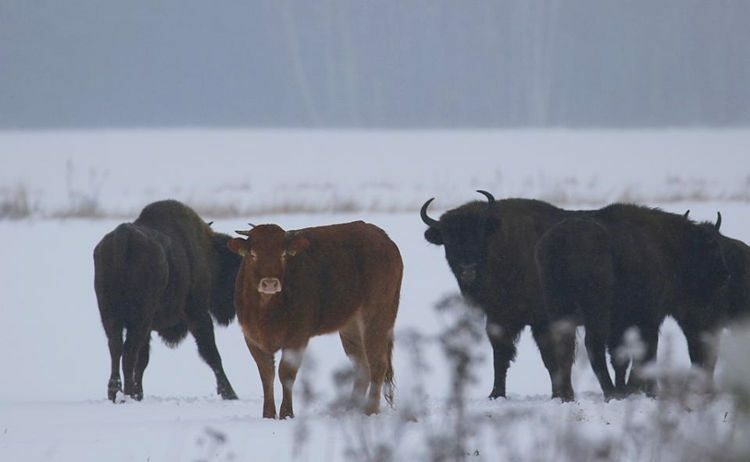 Here’s something you don’t see every day, a cow in Poland apparently got so bored of its life as a domestic animal on a farm that it escaped and joined a herd of wild bison on the edge of the primeval Bialowieza Forest, on the Belarusian border The copper-colored cow has been living with its new bison family in eastern Poland for the past three months, and seems to have adjusted just fine. The first person to spot the cow in the bison herd was ornithologist Adam Zbyryt. At first glance, he thought the small reddish brown specimen was a bison exhibiting a mutation. However, after focusing his binocluars on it, he realized it was actually a Limousin cow, a French breed that is popular in Poland. The young bovine appeared healthy and at ease with the bigger animals. “It’s not unusual to see bison near the Bialowieza Forest, but one animal caught my eye. It was a completely different light-brown shade from the rest of the herd. Bison are chestnut or dark brown”, he told TVN24. Photos of the cow sticking out like sore thumb among the bison went viral in Polish media a few months ago, but naturalists were sure the animal wasn’t going to last long in the wild. They assumed that as winter set in, it would wander back to the farm from which it had escaped, but they were wrong. A few days ago, the cow was spotted again, this time by biologist and bison expert Rafal Kowalczyk. The domestic animal looked healthy, and at ease among the bison herd. He told the Associated Press that the survival of the cow in the wild is likely thanks to the thick fur common to the Limousin breed combined with the unusually mild winter in eastern Poland this time of year. Dr. Kowalczyk, director of the Mammal Research Institute at the Polish Academy of Sciences, described the situation as extraordinary, saying that it’s the first time he has witnessed a cow living among bison. “She is not very integrated with the group, as bison act like one organism and she stands out,” Dr. Kowalczyk told TVN24. He added that the herd had probably kept her safe from the wolves that hunt near the edges of the Bialowieza Forest throughout winter. Although the cow herself might be out of danger, Dr. Kowalczyk warned that she could pose a threat to the bison themselves. The unusual camaraderie could lead to mating, which would contaminate the endangered gene pool of about 600 Bialowieza bison with hybrid offspring. The wild bison population went extinct in Poland after World War I and had been restored by conservationists with the help of specimens in captivity. “Another danger is that hybrid calves are large, and the cow could die giving birth,” the biologist told TVN24. For now, however, the story of the rebel cow who defied her slaughterhouse fate to roam free with bison is a hit on Kowalczyk’s Facebook page. Scientists intend to remove the cow from the bison by summer to prevent mating, although Kowalczyk said that wouldn’t be an easy process.